Happy Fat Tuesday! As the Mardi Gras festivities begin let’s raise a glass to one of the most colorful cities I have ever experienced- New Orleans. On this night three colors reign supreme throughout ‘The Big Easy” — each one symbolizing the meaning of the holiday: purple — justice, green — faith and gold –power. 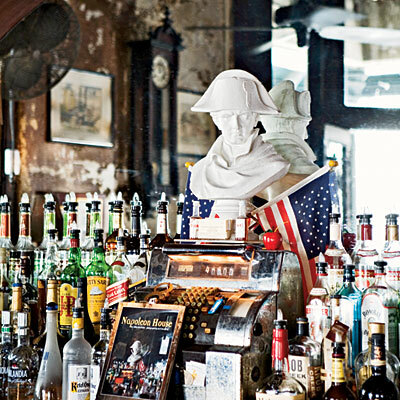 I’m stuck in cold NY, but if I were able to transport myself to New Orleans for Mardi Gras you would find me at the Napoleon House Cafe partaking in some king crabs, king cake and drinking a king-size glass of my favorite cocktail- a Pimm’s Cup. And while I have this fantasy going I might as well put myself in a special little ‘only at Mardi Gras’ ensemble because word on the street is if you not in costume, then you better be in the colors of the day. Notte by Marchesa Ruffle Dress, Lanvin Mettallic Pointed Pumps, Jimmy Choo Tube Satin Clutch, Fendi gold FF cuff all from net-a-porter.com Okay this outfit is perhaps about as practical for catchings beads and doubloons on the crowded streets of the French Quarter as it is on my bank account but alas, tonight is for fun- let the fasting begin in the morning! Do you do anything special for Mardi Gras? Julie Hoylen is a home and fashion stylist living and working in the greater New York City area. When she isn’t talking to the media, designing a fabulous room or putting together the perfect outfit you will find her teaching Pilates, walking her dog or enjoying time with her family. So great meeting you last night!!! can’t wait for you to come up and do some antiquing! love the outfit and the drink and I have some fun chunky beads to accessorize! Not practical for Bourbon St. perhaps but certainly an outfit that puts you in the spirit of Mardi Gras and sitting back with a Pimm’s Cup even on a cold winter day in DC sounds great. One of my all-time favorite cities, and such great color inspiration there on the many painted stucco and wood-siding homes. I like your idea to bring a little Mardi Gras into our own home. To further set the mood, you might consider purchasing a CD from the Preservation Hall website, or downloading some New Orleans jazz on I-Tunes. Laissez bon ton role! Great ideas, Juli! Happy Fat Tuesday!